"Who Else Wants UNLIMITED Free Traffic By 'Piggy-Backing' On High Traffic Sites Like Facebook, Twitter & YouTube?..." You'll Discover All The Top Sites Where You Can Get Free Targeted Traffic To Any of Your Sites! You and I both know that without TRAFFIC, your website is worthless. you set up a web site with a blog and advertise your products there. You write good content that informs your customers of industry news, new events, sales, product information, and other interesting items for their entertainment. But that is when you realize that there aren’t that many people that even know your site exists. So you begin to feel as though you are wasting your efforts in having that web site. It seems that all of that time and money were spent for nothing. But there is more you can do, and it isn’t costly. And the best thing is, it can be a lot of fun, too. You can use social media to get the word out there, and in record time. Did you ever notice how fast word of mouth can spread? That is the power of social media. One person buys your product or service and they really like it, so they tell a friend, who tells a friend, and so on. Suddenly, you have a whole network of new customers that visit your website nearly every day, and keep track of your business through their social media sites. Not only have you gained a bigger customer base, but you have had the opportunity to “meet” and get to know your customers. By participating in social media, you have a better idea of what your customers want and you are better able to render service to them. You are also able to add new products and services that they are looking for, creating a loyal following of return customers. So, with that said, I've written a special report giving you everything you need to know about getting social media traffic to your sites. 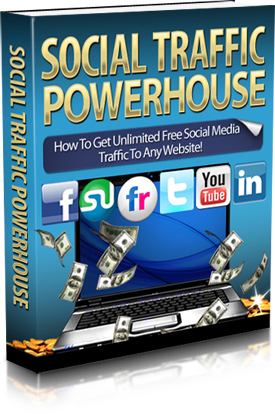 How To Get Unlimited Free Social Media Traffic To Any Website!